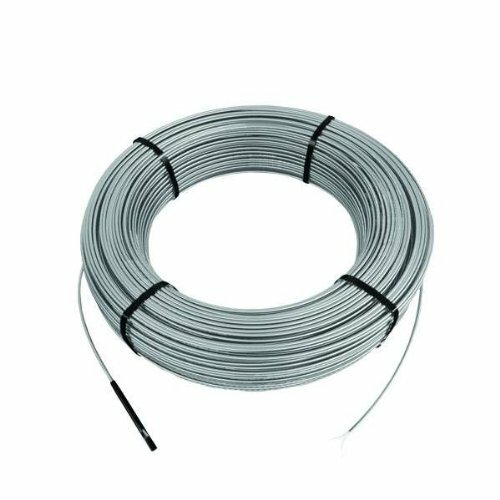 DITRA-HEAT twisted pair heating cable is designed to snap into DITRA-HEAT uncoupling membrane (sold separately). Manufactured by Schluter-Systems, EMF-cancelling DITRA-HEAT radiant heating cable installs directly into DITRA-HEAT or DITRA-HEAT-TB cable installation membrane (sold separately) for use under tile or stone flooring. Significantly reduced installation time. No self-leveler required! Do not purchase a heating cable the same size as the area to be tiled; this will be too much heating cable! Never CUT the heating cable. This would change the cable resistance and could lead to a fire. If you have any questions about this product by DITRA-HEAT, contact us by completing and submitting the form below. If you are looking for a specif part number, please include it with your message.